The small Washington portion of this vast ecoregion comprises the Selkirk Mountains of the northeastern corner of the state and a narrow fringe of mountains along the Idaho line south of the Spokane Valley. From here the ecoregion extends east and north through the Idaho Panhandle, northwestern Montana, and southern British Columbia and Alberta to the continental divide and the upper east slopes of the Rockies. The Selkirk Mountains and the Pend Oreille River, flowing north through a trough within the Selkirks, are the dominant landforms in this ecoregion. Beginning at Mica Peak southeast of Spokane, the Selkirks extend north along the Idaho-Washington border for more than 100 miles, continuing into Canada. Though often spoken of as part of the Rocky Mountain system, they really belong to an earlier geological epoch and consist mainly of crystalline or highly metamorphosed rocks such as granites, gneiss, and schists. Their outline, too, is rounder and less serrated than that of the Rockies, as a result of gradual erosion from the ebb and flow of glaciation over the last two million years. Today's landscape, dotted with many lakes, bogs, and marshes, emerged from the melting ice about 10,000 years ago. Elevations range from about 1,300 feet on the Columbia River at Northport to peaks above 7,300 feet. The climate is influenced by both the maritime climate that brings dry summers and the continental climate that brings precipitation throughout the year. Thus valley floors in the northeast corner of the state are wetter than similar elevations in the interior to the west and south. Annual precipitation ranges from 20-30 inches in the southern lowlands to about 80 inches in the northeast corner. Temperatures dip below freezing in the coldest winter months throughout the ecoregion but ascend to more than 80 degrees F in the drier southern part in midsummer. Significant snow pack develops at middle and upper elevations, which become colder in winter than similar elevations elsewhere in the state. Vegetation cover within the region varies with precipitation, temperature and elevation. Douglas-fir and ponderosa pine make up the predominant tree communities at lower elevations. Stands of grand fir, western hemlock, and western red cedar occupy wet valleys at the northeastern corner of the state, producing forests much like those of western Washington. Understory plants are similar, with ferns, blueberries, currants, and spiraeas, but are often species different from those west of the Cascades. The subalpine ecosystem occupies mountainsides and valleys above 5,700 feet. The principal forest community of the lower subalpine zone comprises Engelmann spruce, whitebark pine, and lodgepole pine. Subalpine fir dominates the upper subalpine zone. Western larch and western white pine can be major components of the moister forests. Recurrent fires have played a significant role in the development of the forests in this ecoregion, favoring fire-resistant species such as lodgepole pine, which covers huge areas after burns. Grasslands, variably dominated by green fescue, Idaho fescue, or rough fescue, occur along the foothills and on higher-elevation, south-facing slopes. Riparian, marsh, wet-meadow, and lake habitats occur at a range of elevations. Only a small part of the region has been converted to agricultural and urban uses; hence its principal habitats are largely intact. Development is concentrated along the Pend Oreille River, where dams have altered or eliminated riparian habitats. Decades of fire suppression have resulted in dense, fire-prone forests. 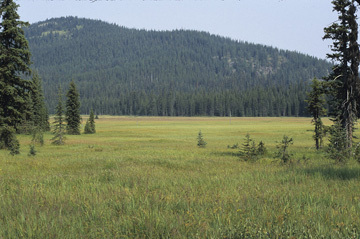 The Salmo-Priest Wilderness Area contains a large area of virgin conifer forest. Logging, as usual in forested regions, is the main source of disturbance and habitat destruction.